A few days ago we reported on Inchvilles, a new take on the toys-to-life concept which allows you to 3D print your own characters for use in-game. Developer Moragami has now put the game's crowdfunding site live, and has also released a new trailer which not only shows off some gameplay, but also gives some detail on the figure creation process. 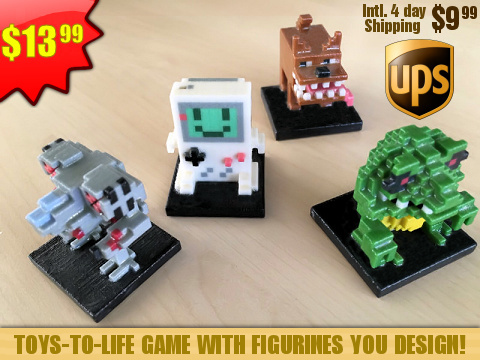 The toys take 6 days to create and another 4 days to ship to your address. The developer stresses that these figures are not required to play the game, and has yet to reveal exactly how the toys will be scanned into the game. The planned platforms are 3DS, Android, iOS and Steam. The total cost per figure is $13.99 / £11 / 13 Euros, with international shipping costing $9.99. The estimated release window is December 2017, assuming Moragami raises the $90,000 goal set by its crowdfunding campaign. Will you be laying down some cash for this venture? Let us know with a comment. That is really nice to see, I like what they are doing. :/ The concept sounds like a cool one- I mean, who wouldn't want a 3D-Printed Toys to Life game. But the game itself... It looks a N64 game with a blur filter and just looks shallow gameplay-wise. I'd buy this because I'm a sucker for NFC figures, but the game does look like it needs work. Neat concept, but hard to believe it's viable as a business idea. The actual gameplay looks mediocre at best and asking over $20 USD (after delivery) for a custom inch-high figure seems cost prohibitive. (3) find a way to bring the price down (which seems tough since almost half the price is in shipping fees). I like the custom toys to life characters yet I also think the game looked like a bland mess it looked pointless they really need to explain how and what the game itself is - what was shown in my opinion didn't look fun or compelling in anyway. Game looks boring. Graphics aren't that bad for the blocky look they were going for, but the gameplay is like watching paint dry. I agree with most of you that the game looks really bland, it kinda reminds me of Flipper (that DSiWare release from a couple years back) in terms of aesthetics, but without the fun gameplay. So yeah, really outdated graphics plus really bland-looking gameplay seems like a no-go for me. At least the concept of printing your own avatar seems fun, though the cost is pretty high for a single figure. Do a lot of people even own 3D printers? I have zero interest in them. Just awful. All of it. Gameplay looks kind of shallow, but I could see myself having fun with this! I'm a big fan of Cocoron for the Famicom, so I jump at these custom avatar platform(ish?) games. The price seems like nonsense, but to be honest it's a year away so that's much less prohibitive than if it was releasing this month. Lots of time for those who want it.